NETWORK UPDATE: THE BACHELOR and the season finale of CELEBRITY APPRENTICE each gained 0.1 in final ratings. BETTER CALL SAUL held extremely well in its 2d Monday airing, down just 0.05 to 1.58 to top the night’s cable and looking like a solid hit for AMC. BET’s BOOK OF NEGROES miniseries debuted at 0.61. On VH1, LOVE & HIP-HOP rose 0.11 to 1.49, and BLACK INK CREW dropped 0.07 to 1.00. USA’s WWE coverage was at 1.44-1.37 over its 3 hours, up about two-tenths from last week. 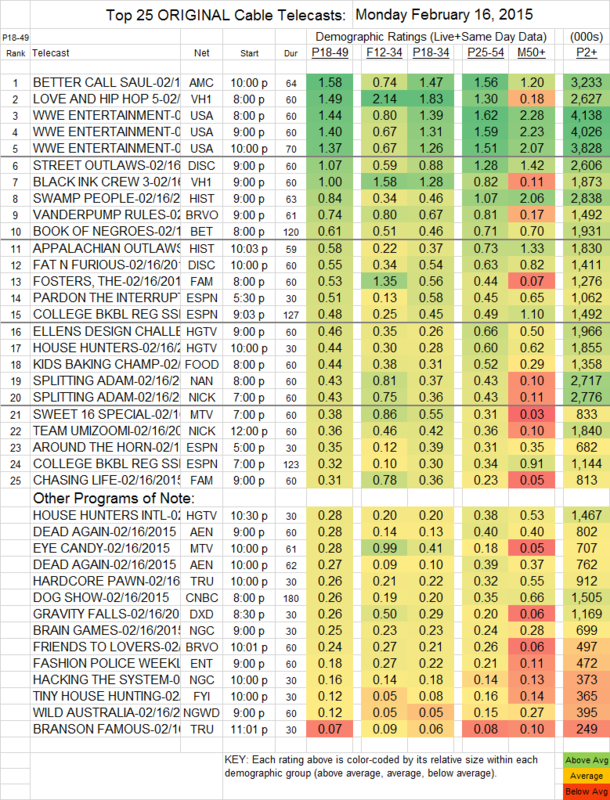 On Discovery, STREET OUTLAWS added a tenth to 1.07, and FAT N FURIOUS was up 0.12 to 0.55. History’s SWAMP PEOPLE took a healthy 0.16 jump to 0.84, and APPALACHIAN OUTLAWS gained 0.04 to 0.58. Bravo’s VANDERPUMP RULES slid 0.03 to 0.74, with FRIENDS TO LOVERS at 0.24. On ABCFamily, THE FOSTERS gained 0.08 to 0.53, and CHASING LIFE lost 0.05 to 0.31. (In their target F12-34 demo, FOSTERS was at 1.35 and LIFE was at 0.78, also respectively up and down from last week.) On MTV, EYE CANDY ticked up to 0.28, but 0.99 in F12-34. BRANSON FAMOUS (Tru) was up 0.02 to 0.07.